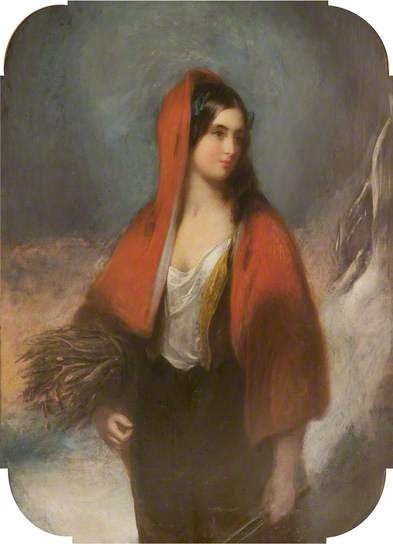 Well, this might be my favourite as we have both a fetching red cape and a sense of decency. I love the bulk of colour in this picture, the white, the deep blue of the night sky and the endless red swirl of her cape. It tells of a sense of pilgrimage, a challenge, the warmth and vibrancy of the human spirit in the deepest, darkest winter months. This woman embodies the Winter Solstice in many ways, being a bright warmth in the sparest of landscapes and the coldest of nights. She is both Winter, the personification of a season, and also existing within it. Although undoubtedly cold up here in the Northern Hemisphere, winter snow could be seen as a cloak wrapped around the ground to keep it safe until spring. 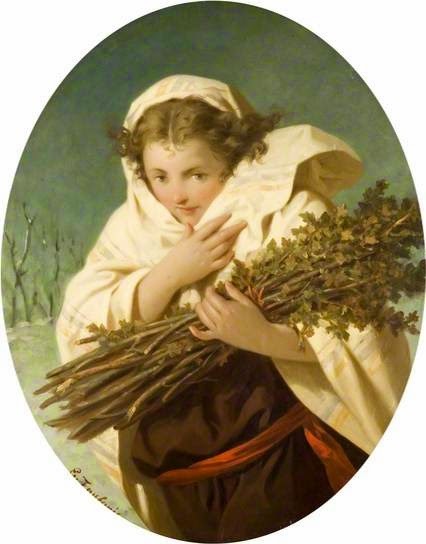 Winter as the protectress of the flowers is unusual but possible to see in this wrapped-up young woman. She freezes and she engulfs, she preserves and she tucks-up to sleep until the sunshine returns to us. What a lovely thought for a cold, wintery day. January is Holman Hunt's The Scapegoat. My Goodness, can you imagine waking up to that on New Year's Day? 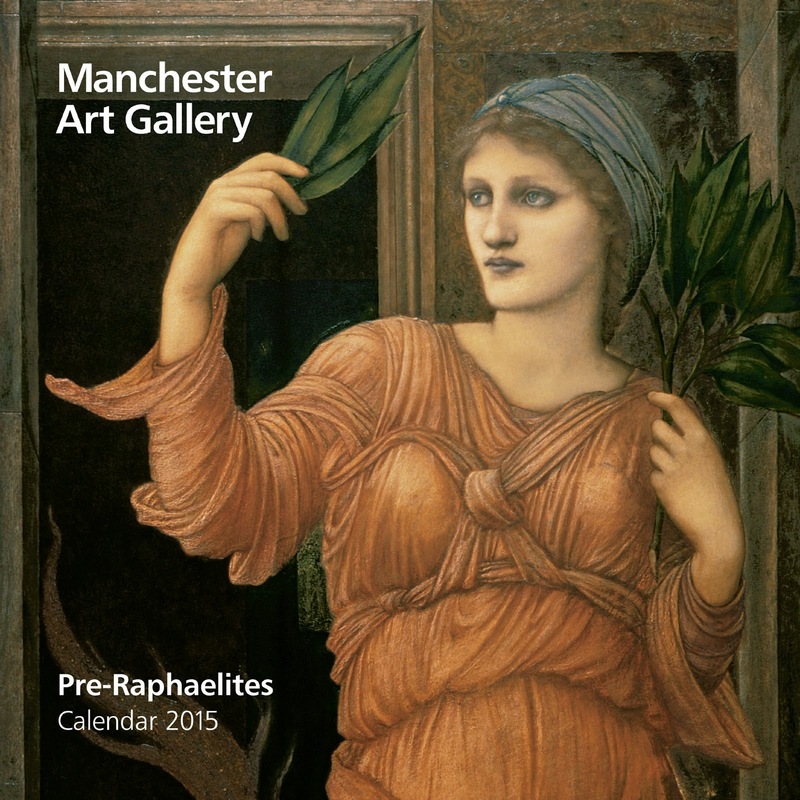 Lawks, that's a test of courage for the year ahead. Happy New Year, here's a doomed goat. If you can make it through four weeks of that dead-eyed bleating, the next 11 months will seem like a picnic. I agree, that girl has much more than firewood on her mind...at least the others are suitably wrapped up against the cold. Whoever thought that The Scapegoat was a good image for starting the New Year? It's more likely to make you throw the duvet back over your head and not come out until Spring! There's no accounting for taste, I suppose. I love your posts - they have been so entertaining! Thank you. 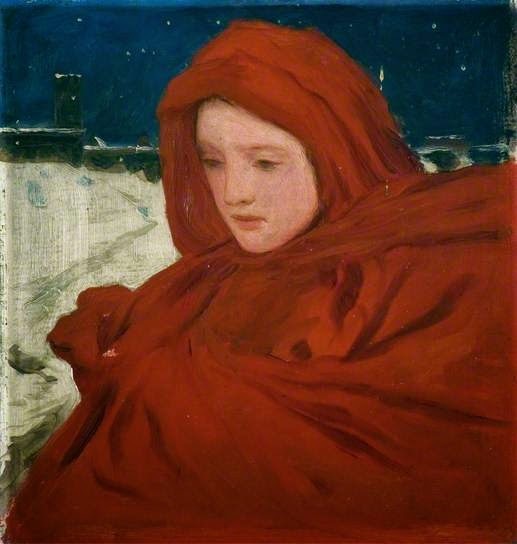 I think the girl depicted in Winter by James Godsell Middleton is from Newcastle. She's actually thinking, "Am I overdressed?"